How does one get the whole world to embrace a surreal science-fictionesque world vision? Through the art of Story Telling you are able to visualize the known, probable, radical, and possible challenges and opportunities that the future holds before you. Throughout history story-telling was used to capture imaginations which facilitated change. Each story-teller has unique techniques and style. Science fiction can take a speculative peek into advances and weaves them seamlessly into an engaging plot. The characters help us to visualize scientific effects on individuals, humanity, and upon the earth. How often does science fiction end up being a reality? Comic books, sci-fi literature, movies, and futuristic television series is triggering an interest in researchers who acknowledge the role science fiction has played in inspiring breakthrough technologies. But just how large is the impact of futuristic storytelling researchers would love to know. Science Fiction is used in different ways. One is for theoretical purposes while some explore human-computer interaction. Science fiction shapes our world and as AI encroaches upon the intimacy of your body with enhancements, augmentation and complete human-AI integration the best medium to explore the potential with you is through science fiction. “Sci-fi movies, shows or stories do provide an inspiration for the foremost and upcoming human-computer interaction challenges of our time, for example through the discussion of shape-changing interfaces, implantables or digital afterlife ethics,” say Jordan and co.
Technology companies such as Google, Microsoft, and Apple have brought in science fiction writers as consultant to explore fictional futures. Science fiction frees our thinking from constraints. They call this science fiction prototyping. Science Fiction is primarily created and consumed for entertainment. Recently, however, it has had an “off label use” as a form of crowdsourcing to generate predictions about the evolution of technology and society. Older science fiction stories described aspects of an imagined future that were eventually borne-out. Newer fictional works contain thought-provoking ideas that seem to have the potential to one-day be realized. What trends and patterns emerge from plausible technological futuristic stories? The Army/DOD recently held a science fiction contest and the data about the stories submitted was analyzed. The following data comes from 104 stories that were 5000 words from eligible candidates. Since the candidates were military most stories dealt with a visionary operational environment. 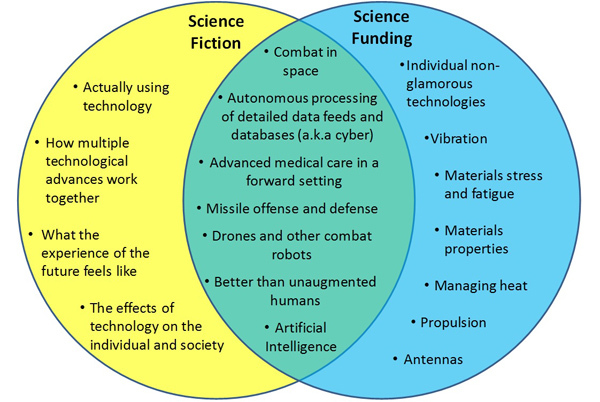 Figure 1 – The goal of this analysis is to understand how the future-looking ideas evoked by science fiction stories about warfare in the coming decade's matches the goals of the DoD research agencies that are preparing for the future battlefield. To correlate and analyze the data a computational model algorithm was developed. Figure 2 – The inputs (unstructured text documents) and outputs (topics and a topic/document mapping) of a Statistical Topic Modeling (STM) algorithm. The topics were mapped out from all the corpus vocabulary. The background color of each cell is coded, like a heat map, to visually indicate the relative weight of the word within the topic. The science fiction topics in Table 2 show a blend of narrative elements and technological themes. Some topics, such as #3 (medical, surgical, patient, …) and #19 (technology, intelligence, artificial, …) are the signatures of stories that contain discussion of advanced medical or AI technologies. Other topics, such as #83 (forces, attack, force) and #42 (enemy, platoon, squad) are related to narrative elements of stories’ setting and plot. Table 3 show a focus exclusively on technology areas. For example, topics such as #21 (infrared, detector, …) and #24 (composite, materials, …) suggest discussion of research into infrared imaging and advanced materials. 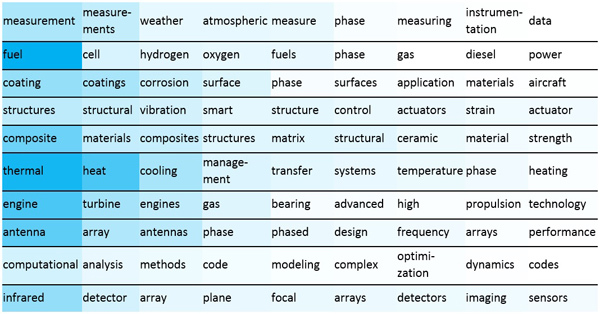 Topics, did in fact overlap in the types of technologies represented. For example, science fiction topic #30 (drone, drones, targeting) and research solicitation topic #30 (unmanned, vehicles, air) both appear to represent discussion of remotely piloted aircraft. Using this measure of similarity, we ranked each of the 10,000 pairs of topics across corpora. 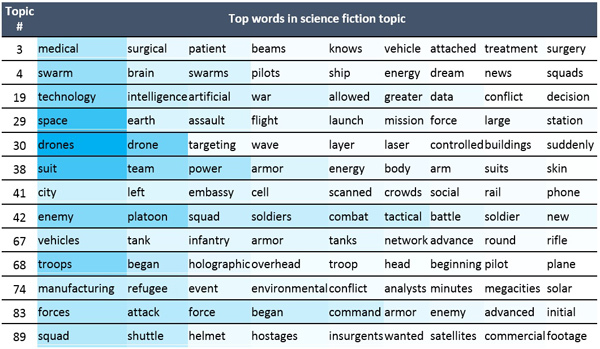 The top 5 most similar topics between the science fiction stories and research solicitations are shown in Table 4. Using the STM algorithm’s mapping between topics and documents that are “about” each topic, we can find examples of stories and research solicitations linked to the overlap topics in Table 4. 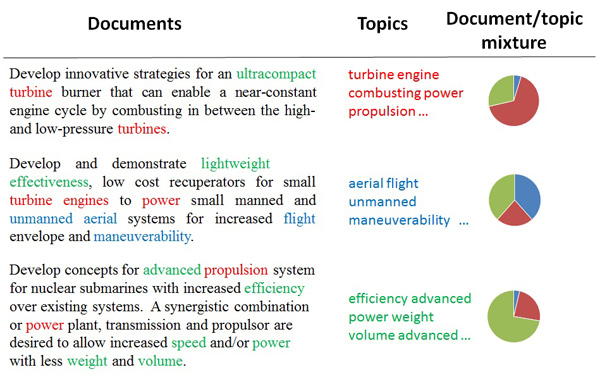 Below, text samples from a science fiction story and a research solicitation from a high-overlap topic are shown to give a sense for the way ideas represented by an overlap topic are discussed in each corpus. 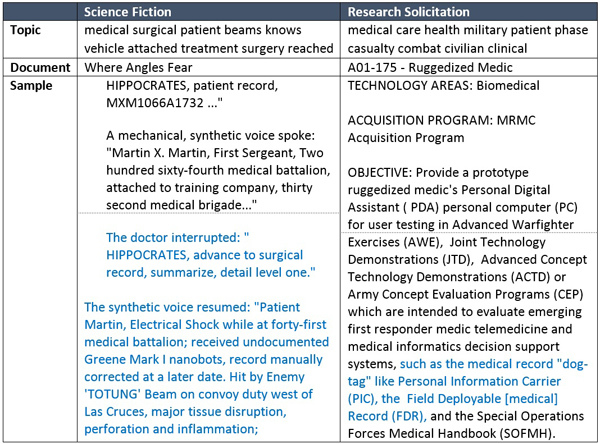 Table 5 – Example of a science fiction story and a research solicitation that are “about” one of the high-overlap topics. 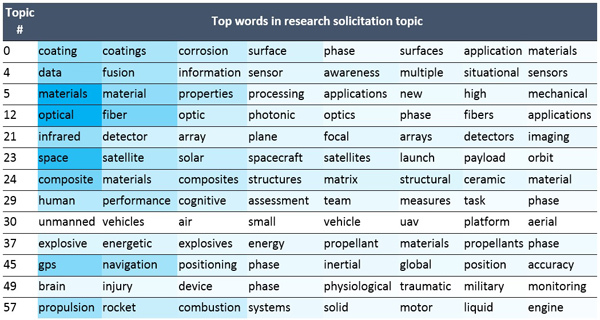 Table 6 shows the science fiction topics that were least like any topic in the research solicitation data set. These topics largely reflect narrative language (didn’t, wasn’t, started, got, …) or plot elements (world, war, …). One interesting finding in Table 6 is the topic troops, began, holographic, overhead, Analysis of the science fiction corpus found that heads-up displays, virtual reality, and augmented reality were frequent technology themes in the story collection. Yet, this analysis shows that the term holographic was in a fiction-only topic. Further investigation of the complete set of 100 research solicitation topics found that the terms virtual and reality only appeared rarely in the topic model, and in contexts related to training simulations. 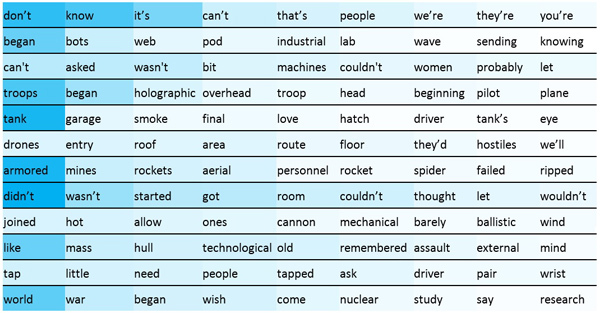 The term augmented was not present in highest-weighted 50 words of any research topic. The idea of using these technologies in an operational setting is not well-represented in the research solicitations. Table 7 shows the research solicitation topics that were least like any topic in the science fiction corpus. The research-only topics represent detailed technical aspects of specific technologies or applications that were not present in the science fiction stories. Table 7 – Research solicitation topics least like any science fiction topic present in both science fiction and research solicitations are drawn from the more glamorous or ambitious elements of funded research. The science fiction stories analyzed tended towards depiction of these “big picture” types of technological advances. Topics representing the “grunt work” of research – materials research, vibration and heat management, etc. – were not highlighted in the works of fiction. Science fiction, on the other hand, devoted substantial content to discussion of how multiple technologies might interact, and the effects of multiple advanced technologies on individuals and society. Figure 3 – Qualitative interpretation of the quantitative comparison of science fiction stories and research solicitations. This research paper provided interesting data from which you can glean provocative and unique insights into the mechanisms of the symbiotic relationship between science fiction and science funding trends, albeit from a military perspective.